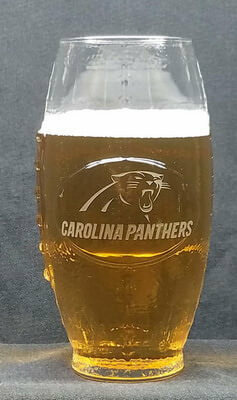 The personalized Football Tumbler Beer Glass is shaped like a football and is a highly attractive glass. It makes the perfect engraved beer glass for the football lover in your life. The iconic football shape and textured glass with realistic lacing on the side wall creates an eye-catching glass and provides extra grip. 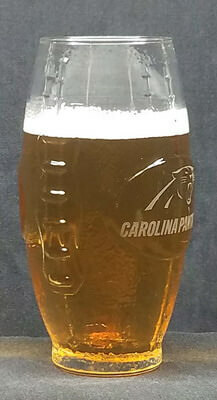 A great gift for coaches and players, this engraved glass is 6.5 inches tall and holds 23 ounces. It’s a nice glass for your football team’s logo. Personalization, text and/or design, on the front of the engraved tumbler is free, other options are available for an additional fee. We suggest keeping your text to 2 lines of 18 characters per line, it is okay to go over, it may just be smaller to fit it on the glass.